Definitely one of the paciest and most intelligent books I've read in a while; like 'Apollo 13', 'Cast Away', 'Gravity' and 'WOOL' all rolled up into one. 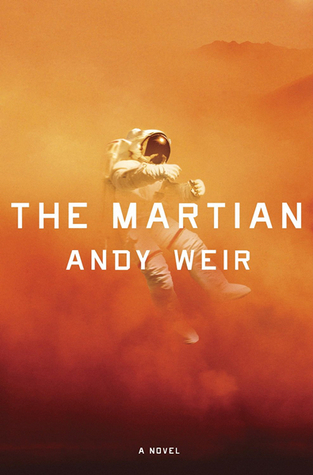 The Martian in question is Mark Watney; the lowest-ranking astronaut on Earth's third mission to Mars, who is accidentally left behind by his crew who believe him to be dead after a storm pummels their base and incapacitates Mark in the process. Completely alone on a largely uncharted planet that is essentially one enormous dusty, rock-infested, pockmarked wasteland, with limited supplies and technology designed only to last for a very limited period of time, Mark must harness the powers of ready wit and good humour, dogged determination and supreme astronautical intelligence to a) survive and b) make his way back to Earth. Fun! There are a few negatives that prevented me from giving the book a full five-star rating. Firstly, after a while, the cyclical way in which something diabolical would happen followed inevitably by Mark solving the problem in a brilliant and ingenious way gradually took all the tension out of the book. Secondly, I found the switch away from Mark's point of view - to NASA, China, his crewmates etc. - to be rather jarring and again, took the tension out of the book. I think the story would have been more interesting, exciting and dread-inducing to read if things had been told from Mark's perspective the entire time, via his log entries and not the occasional inexplicable switch to third person. Thirdly, the flashbacks detailing how certain pieces of equipment were made were kind of unnecessary. I feel like they were put in there to rack up tension when you knew certain bits of equipment were going to fail, but instead it detracted from the very thing it was trying to create. Fourthly, I also would have liked for the biological effects on the human body of living in space for an extended period of time to have been explained given all the technological aspects were explained so perfectly, but other than that it all seemed very plausible. The interesting premise, fascinating subject matter (space and space-travel has always been a bit of a majestic mystery to me), detailed mathematical analysis and firm scientific reasoning however more than make up for the negatives I have thus described. I read this book quickly and hungrily. I laughed out loud in several places (in public, I might add). Despite a lack of detailed psychological analysis, I totally got the uneasy sense that Mark perhaps wasn't always as chipper as he would perhaps like you to believe from his journal entries and that he would be haunted by these events for years to come should he survive. I liked the colloquial, internet-chat-like-speak nature of his journal entries; you never doubted for one moment that this guy was geek to the bone. I imagined a soundtrack peppered with disco and 70s shows whilst Mark trudged about in his EVA suit, drilling holes in metal panels and setting things on fire. I have new appreciation for just how smart the people who work for NASA etc. have got to be, and lament the scaling back of the space programme because of budget cuts and dwindling public interest. All in all, I really enjoyed this flawed, but fiercely intelligent book. It was great fun. Thank you Sophie for recommending it to me. One thing though, if you do want to read and own this book and like to keep your books in excellent condition, I recommend that you do not purchase a hardback copy from Crown books; my copy was clearly very cheaply produced and the hard front cover and spine bent totally out of shape in a very weird way after just a few days. Odd! 33.06% "I have a horrible feeling all of this is merely happening in Mark Watney's head..."